When the whether starts getting cooler, people start pulling out their sweaters and boots, and they start filling their home with pumpkin spice and apples There is one more thing that people always start to think of when Fall starts, candy corn! Whether you are thinking about eating it, or using it as a decoration, candy corn goes hand in hand with Fall. 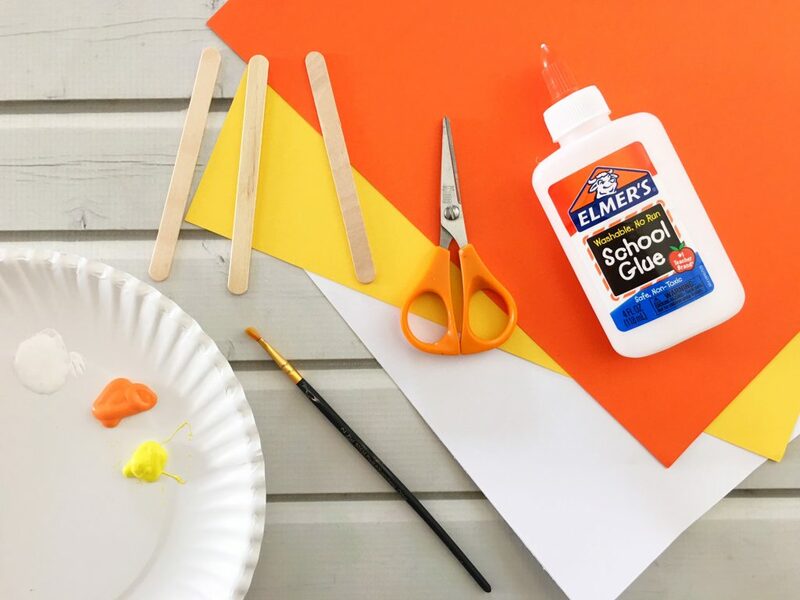 Since candy corn is such a fun part of fall, why not get the kids excited for the season with a simple candy corn craft. The kids can create their own candy corn decoration that can be used to hang on the wall or use as a decoration on the table. As an added bonus, this simple craft is made with things that most people already have on hand. 1. Lay out a piece of scrap newspaper or paper. This helps to protect the surface that the kids are working on. 2. 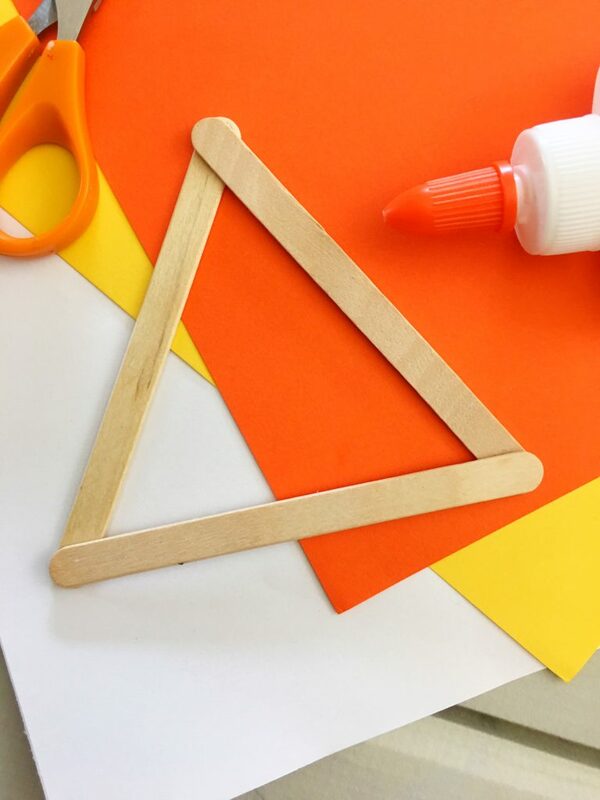 Glue three craft sticks together to make a triangle shape and let dry. 3. 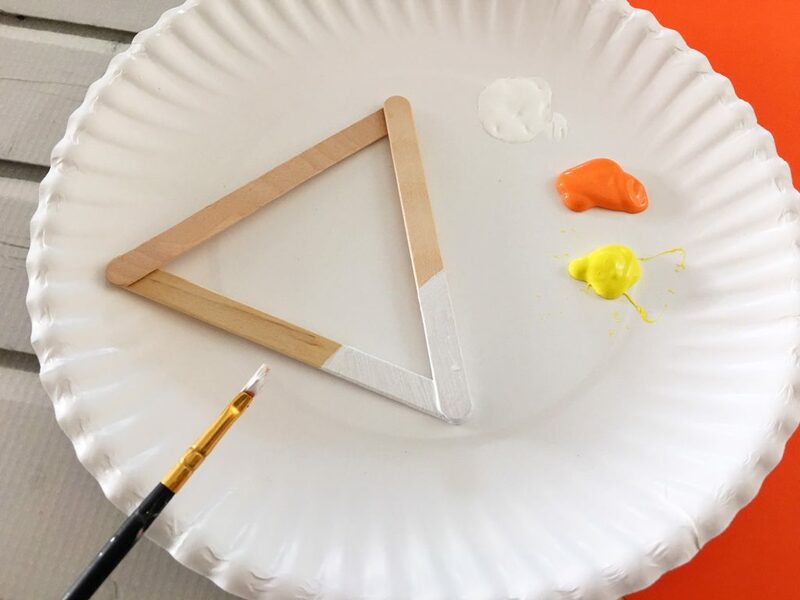 Determine which will be the top point and paint the top 1/3 of the triangle white. 4. Paint the center 1/3 orange and the bottom 1/3 yellow and let dry. 5. 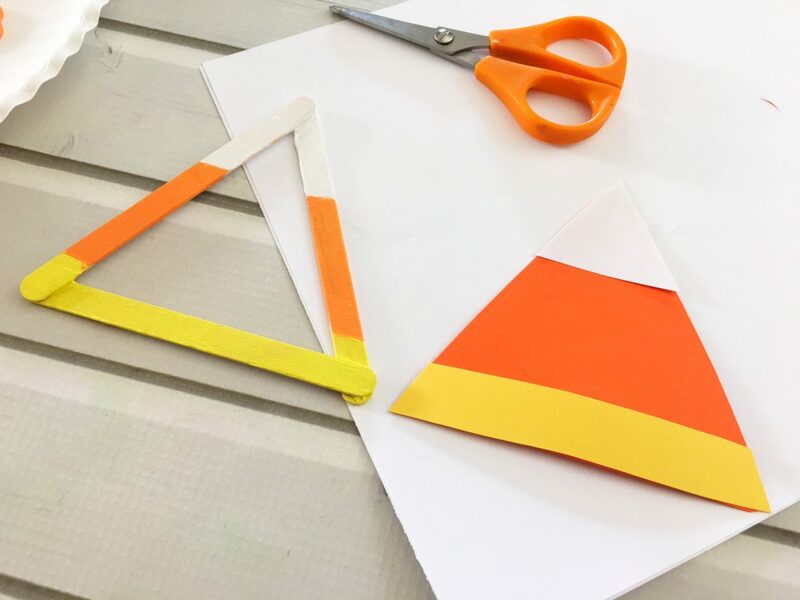 Trace the outside of the triangle onto a piece of orange, yellow and white cardstock and cut out with scissors. 6. Cut the top 1/3 of the white triangle off to match up with the painted craft triangle and glue to the top of the orange triangle. 7. Cut the bottom 1/3 of the yellow triangle off to match up with the painted craft triangle and glue to the bottom of the orange triangle. 8. 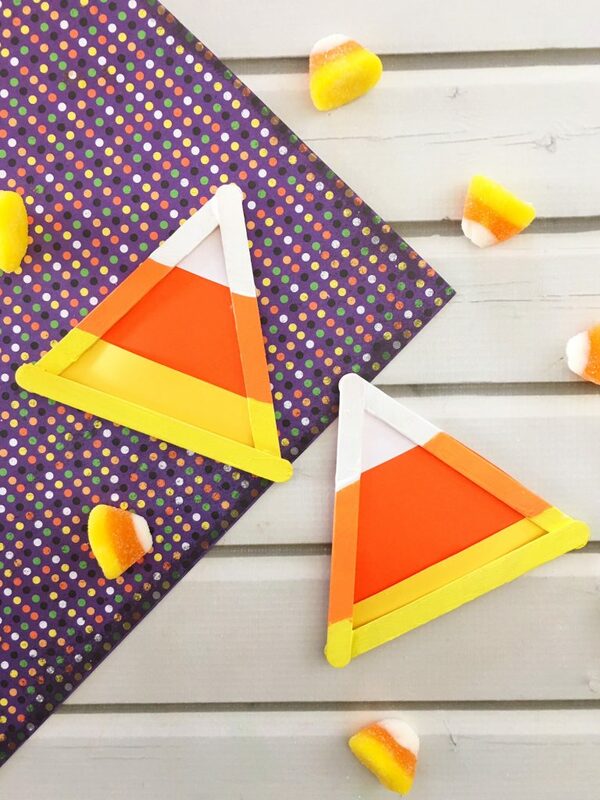 Now glue the paper candy corn to the back of the craft stick candy corn. This is such a cute and easy craft. I love fun seasonal crafts like this one. 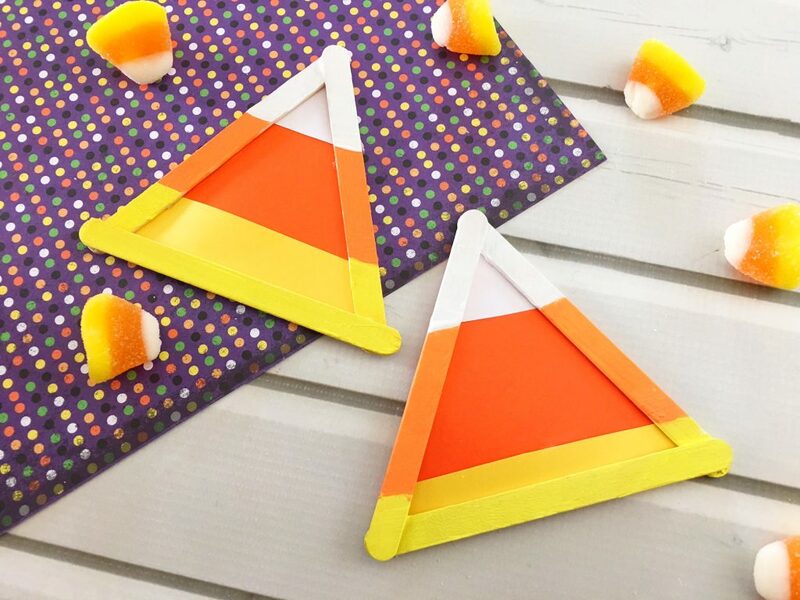 What a cute Candy Corn craft to make with the kids! I love how fun it is to make. I love crafting with my nieces! This is such a cute and fun idea! All the crafts for kids you listed look like fun! Thank you for sharing! What a cute candy corn craft idea that I will pass on to some of my teacher friends. This looks like a fun craft and it’s super cute. Candy Corn is my favorite Halloween candy, so this is the craft for me, lol. I think kids would really enjoy it, too.